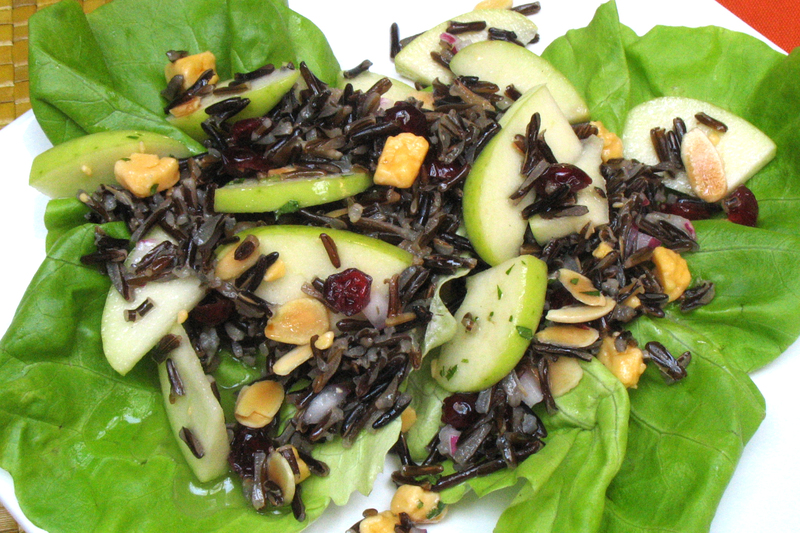 The nutty flavor of wild rice combined with sweet cranberries and apples, salty cheese and tangy wine vinegar make this salad a dance of textures and flavors on the palate. The cheese in the recipe offers a firm bite to accompany the chewy texture of the rice, yet zesty crumbled blue cheese, gorgonzola or feta cheeses are delicious as well. For a main dish salad, toss in cubed cooked chicken. Bring water to a boil in a 3-quart saucepan. Stir in rice and salt; bring back to a boil. Cover, reduce heat and simmer 50 minutes. When done, drain water if any. Cool completely with lid off. In a large bowl, combine wine vinegar, oil, sugar, mustard and salt; stir well. Cut apples into bite-size pieces and toss with dressing. Add rice, cranberries, onion and cheese to bowl; stir. Stir in toasted nuts just before serving. Serve on lettuce leaves, if desired. While rice cooks, prepare remaining ingredients. To cool rice more quickly, spread it out on a sheet tray and refrigerate. Do not cover. Rice may be made several days in advance. Store in refrigerator, covered. This salad is fantastic! I just made it for a work “Thanksgiving” and instead of Dijon, used a maple mustard which gives it an added sweetness. Used a mixture of dried cranberries, cherries, and blueberries. Maple mustard sounds fantastic. What I like about this salad is the chewy wild rice and the sweet-tang of the other ingredients. Did you add a tangy cheese? I used Parmigiano-Reggiano. It was perfect. I’m making it again for Thanksgiving Day dinner with friends and family. Oh, and I used olive oil, instead of canola. I ate the salad again last night for dinner and I cannot stress how good I find it! Oh, I served it on a bed of arugula.